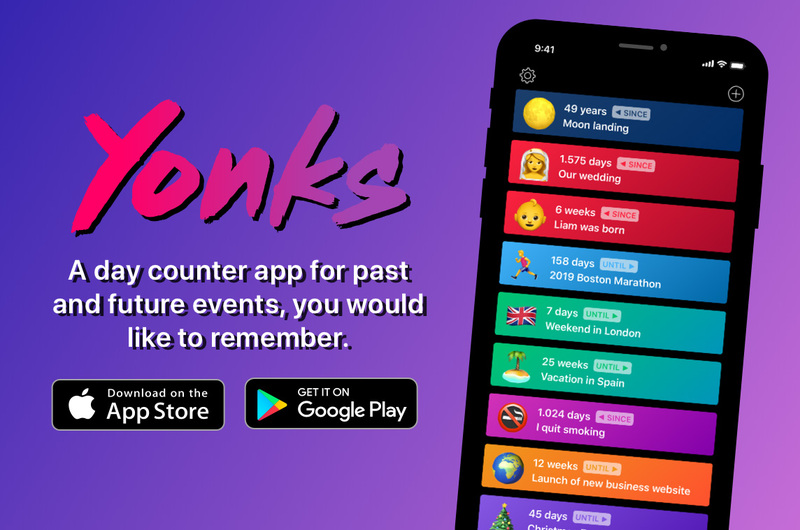 "Yonks is a day counter app for iOS and Android. It allows you to add counters for events in the past or future, which you would like to remember or which you are anticipating. Every counter is fully customizable and let's you choose a corresponding emoji, an individual color and a main unit to count in (minutes, hours, days, weeks, months and years). A counter's details view shows it's notable milesstones (e.g. "1.500 days since you've been married") and has place for additional text notes. To give users an idea of what to add, Yonks provides a growing list of popular suggestions with past and future events form a variety of categories like holidays, history, sports, tech, movies and music. The Yonks iOS and Android app is build with Cordova and Vue.js (+ Vuex + Vue-Router). The Yonks website is buit with Nuxt.js."